Front row (left to right): 1. Karen Butts, 2. unidentified, 3. Melba Hasett ?, 4. unidentified, 5. unidentified, 6. unidentified, 7. unidentified, 8. Bonnie Hampton, 9. unidentified, 10. unidentified, 11. unidentified, 12. unidentified, 13. Susan McLaughlin. Second row: 1. Kirk McNutt ?, 2. unidentified, 3. Lois Anderson, 4. Vicky, 5. Marian Richards, 6. Mary R. Wallace, 7. unidentified, 8. Margaret Wallace, 9. Judy Thonack, 10. Carolyn Yanes, 11. Jim Strom, 12. John Ethridge. Third row: 1. unidentified, 2. Frank ?, 3. Donald Sands, 4. Kirk McNutt ?, 5. unidentified, 6. Paul Armstrong, 7. unidentified, 8. Ed Cassidy ?, 9. Finis Hudson, 10. Dennis Richardson, 11. unidentified, 12. Paul Chaplic. Credits: Scanned by Dahl Stanford. 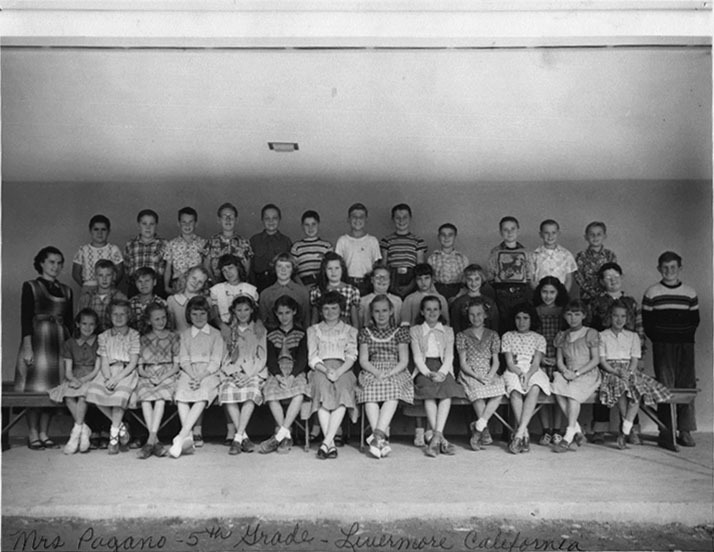 Thanks to Susan (McLaughlin) Beus, Dahl Stanford, Jim Street, and Esther (Cleek) Rupley for identifying the kids in this picture.